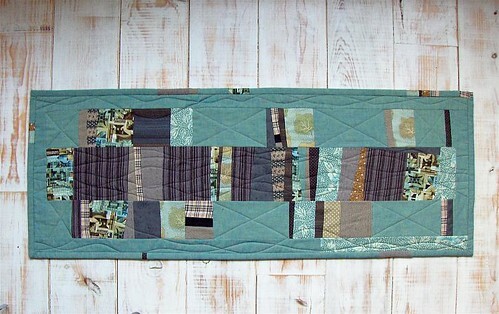 A table runner made up of left overs and scraps from a tryptic made a while back. I decided to just start sewing, put the pieces together and see what happened. Not an easy thing to do and had to change my mindset because I've been working on projects requiring accuracy, but so relaxing letting it all go but the brain in neutral and just let the fabrics to their thing! Sorry about the funky looking color, but after many, many moons I've picked up the knitting needles up again to finish this UFO, a pair of bright orange socks, a very basic pattern, destined to become a Christmas gift. It had been such a long time since I had the needles in my hand, but really, it's just like, as they say, riding a bike! It's tempting me to start knitting more regularly, even pull out the spinning wheel to spin up some fine wool, but "sigh" - there's lots more to finish first before throwing more projects on my plate! Last but not least: a start on Hannah Beeby 1816. I'm doing it in the recommended DMC colors, because I just didn't want to spend the extra money especially since I'm trying to maintain my stash diet, use what I have and only buy what I need, not want. At first the diet was only intended for my fabrics, but I've extended it to all my crafts. Besides, it'll free up lots of extra change to buy that digital reflex camera I've set my heart on: a Nikon D90. I have the feeling I'm forgetting something, but oh well, it'll have to come another time. Now it's back to the needles again, this time sewing on wayward buttons, patching jeans and waxing jackets..good fun! Hi there. 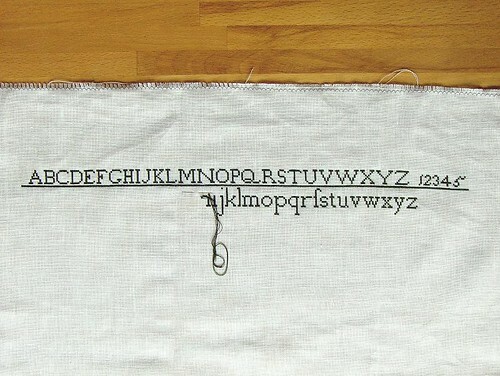 I really love your table runner. The colors just grabbed me. The quilting is great too. 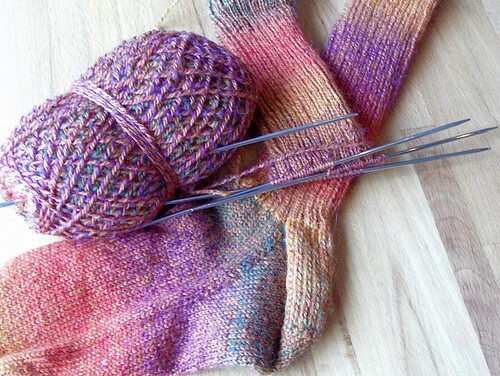 lots of great projects there!socks look great and so does the table runner. I realized I need a new Tree Skirt as the colors are from my old house and don't really go with my yellow & blue house... oh well. Great colors in your table runner! busy girl, lots of good looking projects. Can you believe we had a dusting of snow here in Houston.